Where in the World ? Share your photos! 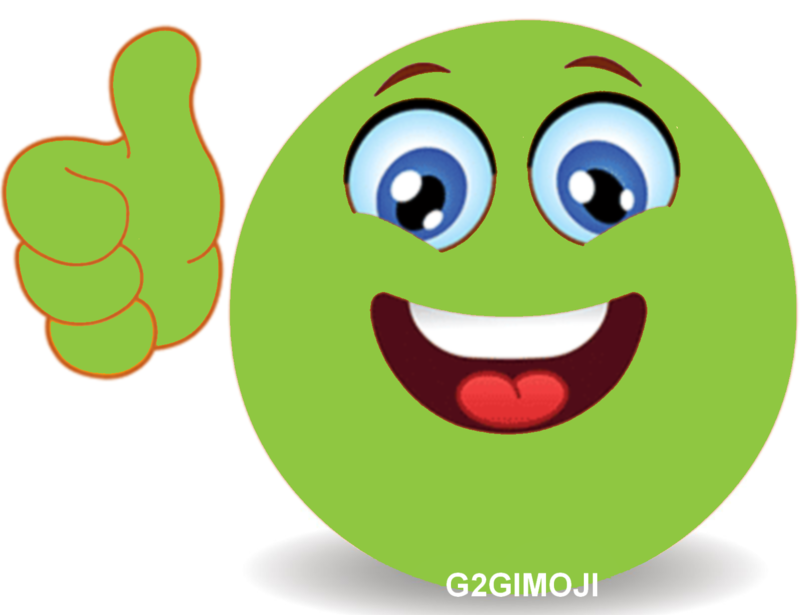 Click here if Interested in Hosting the Weekend Chat and earning a Guest Host Sticker? CHANGE TO BEST ANSWER PROCESS: After much discussion we have come to the conclusion that all answers in the Weekend Chat are of equal importance and weight. So we are going to discontinue the Best Answer portion as it adds points and then takes them away from posters and is causing some hurt feelings. So in the interest of everyone is equal and valued we will delete any best answers given which will deduct those points because it has been pointed out that to give everyone best answer is also not a viable option. Weekend Chat is for everyone. It's a place to catch up on what people are up to and to share what you've been doing. New members can say hello, introduce themselves, ask questions, and meet each other. Our seasoned members can share progress or successes from their projects, give tips and advice, or chime in on hot topics. Post as many answers and comments as you wish. It doesn't hurt anyone to post a lot, and enjoy the multitude of topics. Sorry this was a little late. Had a power outage and even my cell phone was out (because I was recharging it... of course) Anyway, Happy November. Will get the puzzle and tips up ASAP! Ok, Mission Accomplished! I had all of the pieces I needed to bring up the chat ready and boom a power outage! What a mess. They are working on putting in new electric cables in our area and we have had a few short outages this one was a bit longer. The worst was I was cooking breakfast when the power went out and it was not done... So I had the smell but could not eat the raw food (bacon and eggs). Sigh... Did not want to open the refrigerator and let the cooling out and don't have bread or cereal as I avoid them unless the girls are coming over. But all is well and Welcome everyone to the frantic first week of November Weekend Chat! Well you have to have a working grill for that! He has needed to replace the propane tank for over a month. With everything that has been going on it became a low priority... besides... I have never used that 747 thing he uses... I could not even get out of the garage because I can't pull the release thing with my back and neck situation. It was a highly frustrating morning. Last time they at least gave us a notice but not this time. I am assuming it was the electric company but it could have been some other utility since there is a lot of infrastructure work going on around here right now. I opened my front door and saw a truck and went over to find out when it might be back on and the guy told me should be by 11:15 my time which is 12:15 Eastern time so I prayed and hoped for the best! Laura, I have portable stoves that require no electricity for the exact reason you mention. Yeah I need to look into something... I guess I could have built a fire in the back yard but then I probably would be breaking some county ordinance and get fined! Thank you for hosting Laura. We have alternative cooking methods in case electricity goes out. Here if you have no power you also do not have heat. In the winter, that is not fun. But at least the food won't go bad if it is that cold out. Make sure to check page 2 for more posts! DID YOU KNOW THAT DAVID SELMAN BECAME A LEADER OF THE INTEGRATORS ALONG WITH BEA IN AUGUST? YEP WE TOTALLY MISSED THIS MONUMENTAL ACHIEVEMENT. SO, A BELATED CONGRATULATIONS TO DAVID! Congratulations David, Wikitree is so lucky to have you. Thank you for all your hard work. Thank you, Laura, very much appreciated! Thanks Everyone who stopped by our Weekend Chat. Hope you all have a safe week and if you live in the US please remember to vote. Hope to see you next Weekend! A couple of chats ago I mentioned a profile I started for a man who had a misplaced military gravestone was found in someones rubble pile. I am happy to report that on the news tonight they mentioned that the stone is now with a family member, so with that in place and a profile on WikiTree for him I would say this one was a win. That is really super, Dale. You have done a very good deed. A wonderful kindness, Dale! l have had experiences like this which has committed me to trying to return a favor when I can. At least one person in this world will always remember you as a good soul. So, we have not turned the corner to November. Where has this year gone? A lot of time from November through December our time becomes more limited for working on WikTree because of all the added activities due to shopping and celebrating various holidays. 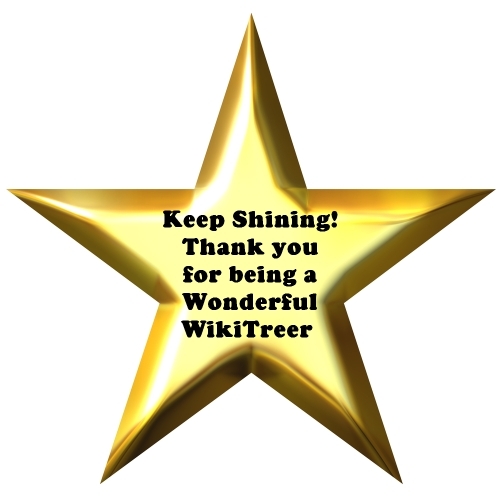 So my tips today are all about quick things you can do on WikiTree to still support our tree in short bursts of time. Other things that can be quick things to do for the tree is to check G2G and answer a few questions from your own knowledge. You might be surprised how much you actually know! And don’t forget about checking your Suggestions. If you did just one a day it will whittle down the list! If you have other things you think are great things to do in short amounts of time. Please add to this list throughout the weekend! Excellent tips, Laura. Just the thing for me. As Pip said, excellent tips! I usually use a source citation when available instead of a direct link. I am old school I can copy and paste but those citation things boggle my brain.. I never use inline citations because I don't like them. I prefer to say where the source is with the notes. 1800 Census Record, then click the big C in the edit box it adds the open and close tags, copy the citation, paste between the citation tags and click preview and save, like magic the citation appears under the sources and reference tag with the direct link to the record. The source citation appears here like magic and does not show in the biography when not in edit. It is pretty easy to do, but it sure makes the Edit window hard to read! It would help a lot if the edit software made the tags a different color. How's the weather, you ask? Northeastern Ohio was 10 inches over average before the recent rain of slightly more than 2 inches, so we are probably about a foot over average on precipitation so far this year. Voting by mail has advantages. We've been doing it that way the last few years. Try it, you'll like it. I read somewhere that the weather this year for much of the US should be above normal in temperature but some areas where showing above normal in moisture while others were showing much lower rain/snow predictions. I plan to stand in line on Tuesday. It is always fun to see neighbors as we wait to vote. Where I live hardly anyone ever displays a voting sign or answers polls. (It was actually in our subdivision indentures that we could not post political signs but that was amended to one per candidate). So we are those unknown voters to pollsters. Most of us consider ourselves to be Independents and pretty much act that way! I drove through the subdivision with my husband looking at shrubs as we want to replace what was in front of our window in the living room. I did not see one political sign and was actually happy about that! There is so much anger and side taking to extremes it is nice to live somewhere that people just avoid the conversation and do what their consciences tell them to do. Please remember on the Weekend Chat we discourage politics or anything highly controversial. There are flood watches all around northeast Ohio Frank, and I voted over a week ago. I just did not turn it in until early this week. Laura, I voted for the candidate I thought would do the best job and can honestly say that my ballot contained votes for all party's listed on it as well as candidates that had no party listed. other than that I will not mention any candidate by name, anywhere, when asked about my voting record. Dale, I like you have never voted a straight party ticket. I am sure you took your time and made a well considered decision. And that all we can ask of anyone. Totally voting on Tuesday. =) Being in NH we get tons of calls. Bots or otherwise. Good to see you Laura. I have had a quiet week genealogically speaking. Adding more profiles, but nothing exciting. I do have one relative who has purchased a DNA kit this week so we can find out if he is my mothers full first cousin or my mothers half first cousin. There is some doubt as to who his Grandfather was. Now we have to wait for the kit to travel all the way from Europe to New Zealand, have him do the test and then send it back to Texas. Results not expected until January during or after the Xmas rush!! No chat for me today since both my mother and my sister are away from home this weekend. Other than that, I expect a quiet weekend. Robynne you have really done a lot in a small amount of time on understanding your bio family. It does take a while for kits at this time of year to get processed. Some of the companies have already begun Holiday Sales. The My Heritage premium-plus prize I won in the Source-a-thon has been absolutely wonderful - allowing me to make contact with so many more relatives that I could not previously do with my free account!! I will be very sad when the one year prize expires and I have to go back to the free account - but at least my (expanded) tree should stay in place. Robynne that is great. Use it to the full extent so you get as much as you can in one year. Enjoy your quiet weekend, Robynne! November 2, 1889 both North and South Dakota became the 39th and 40th States in the USA. While they share the name Dakota the two states are very different with the South having the larger population and ties to the cities along the Missouri River and the North with ties to Canada and Northern US States accessed via railways. See https://www.wikitree.com/wiki/Space:North_Dakota for more information about the history of North Dakota. The leader of this project is Alison Andrus. It is not necessary that you be related to someone who lived in either state to join. Anyone with an interest is welcome! Today’s puzzle is to highlight some of the interesting aspects of each of the Dakotas. Identify if the person, place, or tribe is associated with North or South Dakota. Friend of mine wants to settle in Wall, South Dakota. He said it's the last place people would ever expect to find him. I don't wanna know why. http://www.wall-badlands.com/ I have been there and it was quaint. My late husband and I were in Sth Dakota 13 months ago. My one regret about the trip wasn't how cold it got in September, but that I didn't take the chance to visit the mammoths. Other than that, I was absolutely blown away by the scenery, as was he - and he was the American. We managed to see Bear's Lodge (I love the various names the first nations have for the place and prefer to use this one) and to drive to Montana far enough in to set foot to the ground so I could claim it on my "states I have been in" list. Truly, I highly recommend every American to go see what's there. It is glorious (and I say that as someone who as been Outback). 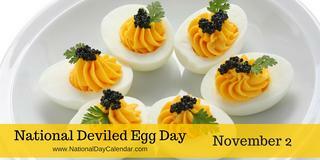 A favorite hors-d’oeuvres or side dish for parties, holidays, family reunions and potluck dinners, deviled eggs are the star of the show on National Deviled Egg Day which is observed each year on November 2. Deviled eggs are such a well-loved food that for which specially designed carrying dishes and plates have been made. The deli section of the grocery store prepares packaged deviled eggs, and they can be found in some convenience stores, too. Deviled eggs, also known as eggs mimosa, stuffed egg, salad eggs or dressed eggs, are hard boiled eggs which have been shelled, cut in half and filled with the hard-boiled egg’s yolk mixed with other ingredients such as mayonnaise and mustard. Eggs are quite versatile when it comes to making simple dishes elegant. The deviled egg is another example of taking the humble egg and being able to add one or two favorite ingredients to make a dozen eggs a beautiful centerpiece. By using colorful relishes, spicy peppers, pimentos or savory herbs, deviled eggs take on an entirely new flavor profile, demonstrating once again just how delicious this family favorite is for special occasions. Make them a little more creamy with sour cream or a bit more tart with added vinegar, and just about every palate can be satisfied. From the traditional paprika garnish to crunchy bacon, or a little caviar, anchovy or herring, there is some devilish experimenting that can be done. The first known print reference referring to the term “deviled” about food, appeared in 1786. It was in the 19th century that it came to be used when referring to spicy or zesty food, including eggs prepared with mustard, pepper or other ingredients stuffed in the yolk cavity. Enjoy this Basic Deviled Eggs recipe. Love these! Now I am hungry! Due to power outage I did not have breakfast yet! Now you did it! I might have to make a batch this afternoon. Folks know to hide deviled eggs from me at potlucks and reunions until everyone else has had a shot. They know what’ll happen if I see them: four on the plate first thing! Hmmm so you are Devilish around the eggs? My latest craft project for my kitchen is a sign that says "Wicked chickens lay deviled eggs." Oh Beverly, that is too funny! Hard-boiled alone, or in a salad but leave the devil out of mine! Thank you Dorothy for letting us know of this fine food item for today. What would be the weekend chat without food additives. Can I steal that saying Beverly? To make my own sign / or better yet, get my sister to do it / cause i don't do stuff like that. It is so funny, well not quite to cry for but i like this meme. I really love the dialog folks !! Thank you so much for commenting each weekend. Food is everyone's favorite subject because we eat at least twice a day, so sooner or later we will get to enjoy the same types of food. Deviled eggs, pototos all types of recipes, cakes, pies, ice cream. Like Laura B, just reading these adds the pound to our bellies. Now how many of you have dogs that you need to walk... if it wasn't for my border collie, I would need to buy new clothes every couple of months. I think those are tears of laughter! What a great saying Beverly! Thanks for hosting the chat, Laura! Nothing too exciting this week, just doing my free-range lower-case WikiTreer thing, trolling among the Unsourced. There are long tons of profiles in there that will probably never go away. Maybe we need an 'Unsourceable' template? Beautiful clear weather is back after last weekend's little rain/snow event. Getting pretty darn cold, too. Time to stock up for winter. Bonus pic - here's something you don't see every day! Love the squirrel. Is the paper grey? Are those blooms on Mother In Law's Tongue? Never seen that before! Yeah it is time to start thinking "holiday". I have to get my Thanksgiving email out to the family. I host it every year. Thanks, Laura! Yes, the colors came out right this time. 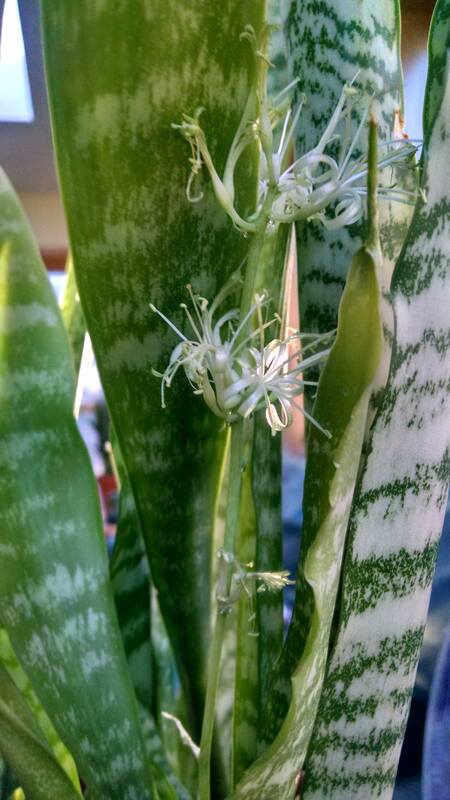 And yes, those are mother-in-law's tongue/snake plant/sword plant/sansevieria flowers. That's a generally pathetic specimen, otherwise. Ugly duckling, I guess. Yes that plant does have a lot of different names. When we were in Hawaii we saw them that had grown taller than a 6 foot man. Everything that I think of as small house plants was bigger there. There was even a bamboo forest with the bamboo being as tall as our oak and maple trees. I've noticed the same thing in Hawaii. Fifty-foot tall Norfolk Island pines growing in people's yards! Herbert, next squirrel need to be white with a light black streak down the back. 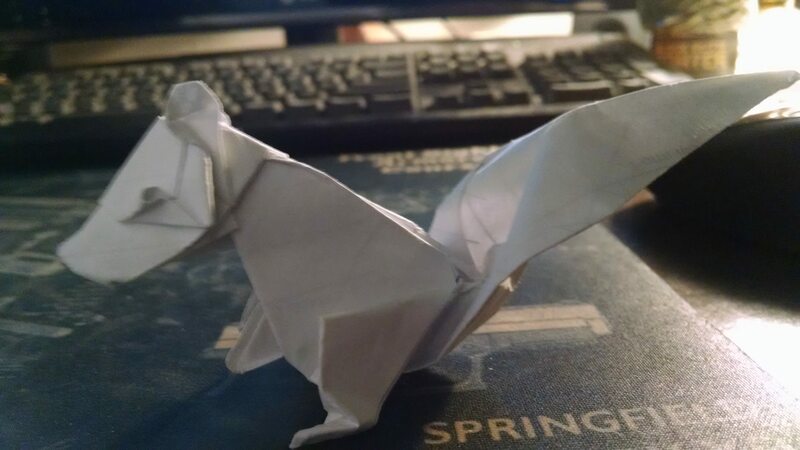 All in honor of the White Squirrels of Brevard, North Carolina! That's weird, Pip. We have 'squirrels' around here with the opposite color scheme. Yeah. This discussion is totally nuts. Nuts for digging around in squirrelly unsourceable profiles! If you need some extra squirrels I can trap and send you some! 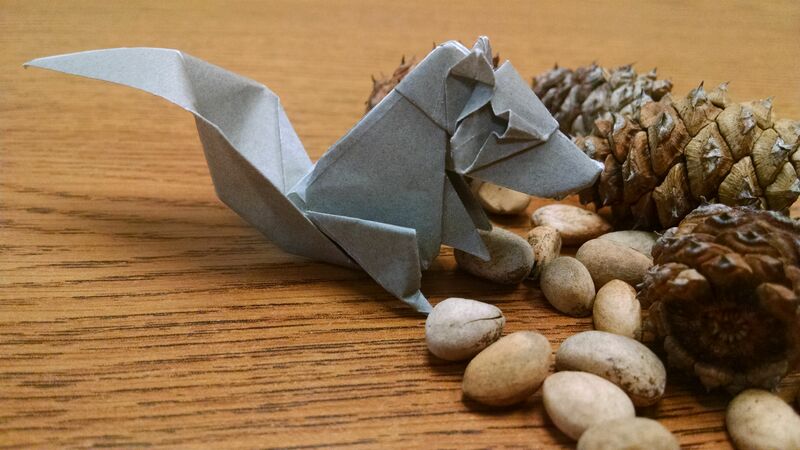 Great origami. Thanks, David! Got all the squirrels I need, thank you. I actually could not find any acorns for the pic (just empty shells). There are also white squirrels in Exeter Ontario. I like the grey squirrel Herbert, you are really getting good at this. Thanks, Laura! You found one by my guru Jo Nakashima. Wow. 'Spread Hex Tessellation.' I gonna make that part of my daily vocabulary. And there's an advanced version! Yikes. I thought you might like it! Pedigree collapse for squirrels... now that’s funny! Navarro and Pip, as a member of the Microsoft Feedback Team I am also a member of its Rewards Program. The have all kinds of quizzes and thing and they had a whole thing on squirrels. So, for your ready enjoyment https://qctimes.com/news/local/ask-the-times/j-d-power-award-black-squirrels/article_445222ac-2f07-5523-86aa-b6658bd61d05.html and https://en.wikipedia.org/wiki/Black_squirrel scroll down in each url to see that even squirrel pedigrees have squirrely stories! Who knew squirrels are so popular? Out West we don't have the standard grey squirrel that comes in fifty shades. I miss them a little, since they entertained me and my dogs through almost half my life. In my area, we have two types, both of which are much more shy than the grey ones. We have the Abert's squirrel, which is mostly black and has remarkable tall upright ears. If you've heard of Kaibab squirrels, same thing. They eat piñon nuts, and my woods are littered with shredded piñon cones. The cones have a lot of pitch in them, and I have always wondered how the squirrels avoid gluing themselves to everything they touch. I believe their caching of piñon nuts has a lot to do with propagating piñon trees. More skittish yet, we have rock squirrels, which look more like grey squirrels, but they are actually ground squirrels not tree squirrels. Up close, their fur has kind of a scalloped pattern, that almost looks like feathers. And that's our squirrel lesson for today. We have red squirrels, they are out during the day, and flying squirrels, they come out at night. Both are very tiny and they love bird seed. And today we saw our very first black squirrel. I think someone relocated it. I will be surprised if he lasts the winter, but after reading they tolerate the cold, he may be alright. He sure looked shiny so he is eating well. A white one. The head came out better - not sure where I went wrong on the grey one. Plain cheap copier paper. Thanks, Laura! Pip, I'm honored! Love the origami as always! Hmm, that would be great to have an 'Unsourceable' category. Something we could visit once in a while to see if we could find something - pool our WikiTree resources! actually know the sound of one woman's car and when she drives in they all start running for the parking lot and wait for her to get out of her car with peanut bag in hand. Guess it is similar to dogs waiting for the school bus every day when they hear the motor coming down the road. Thanks Beulah! My Mom used to have a grey squirrel that hung out by her back door and drove her dog crazy. She believed the previous owner of her house fed it. The squirrels around here don't play golf. I've kind of stumbled into a new personal project - adding all the members of the Hockey Hall of Fame onto WikiTree. If they're there already, I just ensure the category is added, etc. For now I am just adding them with as many sources as I can find, but I plan to go back through them afterwrds and try to connect them. I'll probably have to stop at some point and maybe not add the members of the Hall of Fame that are still alive - I haven't decided yet. I'm currently still unsure how to properly categorize the very early Stanley Cups, as it looks like it is possible more than one team may have held it in a single year since they did a sort of 'challenge' system initially. Stanley Cups from 1914 onwards where only one was awarded in a single year just have their own category with the members of the winning team assigned to it. I'll perhaps muddle over it a bit more and maybe make a G2G post wiht the Categorization project tagged to get their opinion on how best to work out the pre-1914 ones. Kristen what a cool project! Doug the older I get the faster time seems to fly. I hear you, Laura. Last week was May. Laura, the cagey veteran, is plotting her next move, Kent. What will Pip do in response? We'll find out after ten minutes of commercials! Hahahahaha!!! You are Missouri funny! Yeah, gotta wait until I get a break in watching all my wife’s kinfolk in Justified. I am not wearing a red uniform.. blue is my color! Maurice "Rocket" Richard was definitely already added to the tree - I just added a few more categories to him for the Stanley Cups he won! 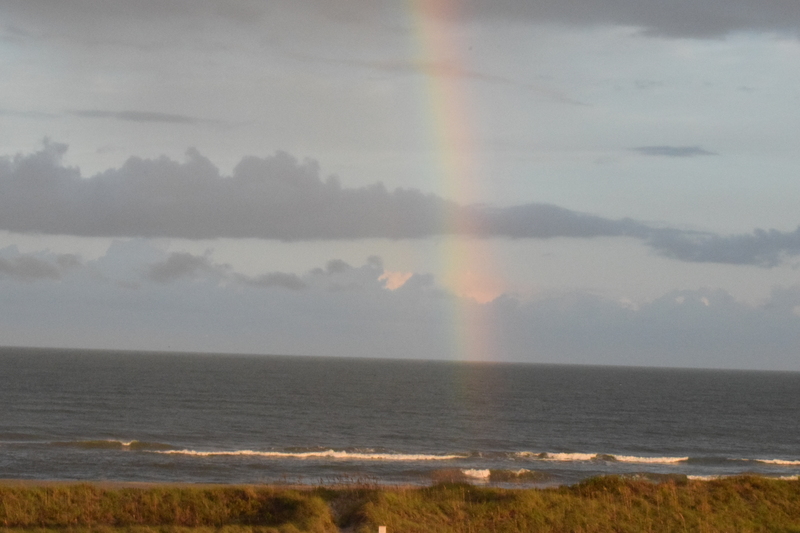 We were in the Outer Banks of North Carolina a few days ago and saw a beautiful rainbow, It was so large, I could not capture it all with the lens I had. The pics show each end. Wow, the left-hand side is really spectacular! Nice job, Doug! Is there any other place in the world more beautiful than North Carolina? Before y’all start chiming in, the answer is “NO!” I’m just sayin’. Oh! Forgot to ask. I was in the Outer Banks a few years ago. Were you in Duck? Great place. Cool restaurants. How beautiful is that, a very awesome sight. 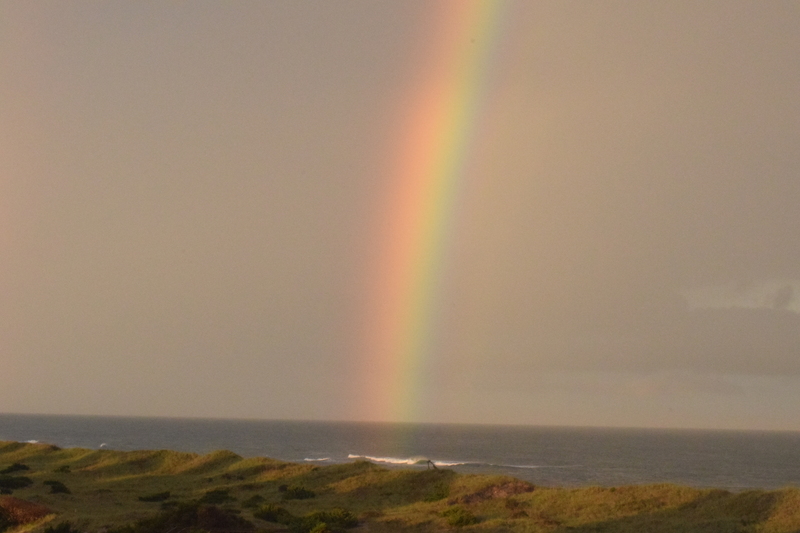 Great photos of the rainbow, Doug! Hey Pip, Texas is the most beautiful state!! We have it all, Prairies, valleys, mountain, forest, rivers, lakes, and the best bass fishing. Just saying!! Last month was a busy one with most of it all piled up in the past week. First time I really called defeat on a homework assignment. I learned a lot in the process but never found the answers to the questions. Oh, well. It isn't really graded. Don't know what this week's genealogy problem will be but it will likely be another that takes 30-40 hours. Finished up the Prince Edward Island Location structure and most of it is now in place. Nice to have the mostly done. The rest of today will be canning applesauce for the winter and figuring out what we need to stock up on that we didn't grow. ...and grow it next year? Posting homework questions would be against the rules. I don't feel quite as bad when my wife came up with the same non-answers I did. She's a bit better at research than I am. The questions come from difficult problems that some very experienced, professional genealogists that they have worked on and may not have published yet and are being used in a couple of other sessions. If you want to really hone your skills, the SLIG Advanced Practicum is very intense and you really do learn a lot. (SLIG == Salt Lake Institute for Genealogy). I'm just happy I'm doing the one where you have a week to do the work rather than 24 hours. Yes, Pip. we usually figure out what to plant for next year about now. We also save seed from some plants that don't cross pollinate (like beans). 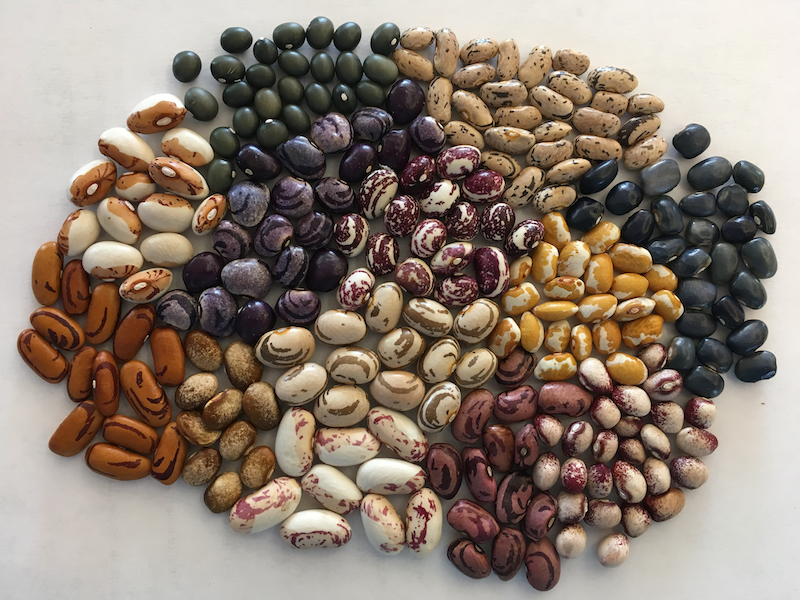 We grow lots of beans (vegetarians use a lot of them) We grew 17 varieties of beans (3 snap beans, 14 dried beans). There are some very interesting ones. Some are really pretty. Also did more than a dozen tomato varieties. Dug carrots, beets, rutabaga and parsnips this past week and planted garlic for next year. So collaboration is against genealogy homework rules? Every genealogist I know calls on other researchers. Part of learning to source is lining up your experts to call. Left out the boring ones you might see in stores. Laura, in this case I understand the issues and I'm fine with it. Its mostly that I've seldom hit a case where I couldn't find anything, especially when it is known that there is a solution. Tomorrow we get to discuss this in a video conference. At least I get tonight off. Two more assignments, one of which will require some DNA analysis. I’d love to see those in a soup on my table. I love beans! On the genealogy front I haven't done much on Wikitree. Just been adding sources on my main tree on Ancestry. I don't know if I've talked about it before, but I proved that Paolo Coppola was the brother of my 2x great grandmother, Caterina and her sister, Concetta. Here's how it broke down. Concetta and Paolo both came to Haverhill. My great-aunt called her "Aunt Zia". Paolo married a woman named Lena in 1909. They had a bunch of kids and unfortunately Lena passed away in 1918. So, Paolo ends up living with Concetta and her family and were living together in the 1920 census. The next year he marries Antonia Yellum and the rest as they say is history. This is Batman level detective work here. Of course it would have just been easier to...ya know...call my great-aunt and ask her about Paolo. Trees on Ancestry have him as born in Sicily, though. Because of course they do. Am unsure if it is true. Sicily is kinda far from San Pietro. I'd need to see official documents and all that stuff. Hope everyone had a great Halloween! Had a good night handing out full sized candy bars. If you don't do that, your house'll get egged. Just saying. You are so good at finding these folks and figuring it all out! Thanks, Laura! I still have a few more mysteries to solve, though! Great detective work Chris! And thank you for your input on that profile the other day I think the work on the Portuguese profiles is making me 'lazy' with bio's lol. I translate baptisms and marriages for those and that takes up enough room. And they didn't have the wonderful information available that we get from census records! Guess I need to crank the music up this week and search through my branches for near-empty biographies...should I go upbeat, or continue with the violin music? Hmm....There's always the Portuguese version of Remember Me, that song from Coco. They really went international with that song. I've seen Italian versions, too. Very cool song. No wonder it won an Oscar. Sad violin music should only be used with Civil War era profiles. With Ken Burns narrating. Thanks, Laura, for hosting the Weekend Chat! Been following the Missouri senate race. I’m a news and politics hound, and I’ll be up late on Tuesday night watching the results. On the genealogy front: I finally figured out the accursed Challenge Tracker. Yeah, that little button at the top of the profile after editing. And I spent most of my time this past month reworking my older profiles, trying to write better bios with inline citations, or just setting them up with sources for later work. Ros Haywood truly has been the model of patience helping me get through the Orphan Trail on the England Project. I found myself, as I worked on profiles of folks with no known connection to me, getting to know and actually becoming fond of the orphans I worked on. I was sorry to let them go for the next one. The leaf-change finally got to Brevard, and it is absolutely beautiful: reds, oranges, yellows, with scattered evergreens. The view from our back deck is Monet at his best. I wish a wonderful weekend for all my fellow WikiTreers! May you find beauty in all of your lives. Would you rather the Phillie Fliers mascot at the wedding? =) He looks like the lovechild of Grimace and a furby. Glad everyone is doing better! Hope the wedding is awesome and that you have a great time! Uhhhhh, no! No mascots. This is a Southern wedding, evening, formal, no goofy millennial stuff! I even nixed the USCarolina bow ties! No, it’s a black tie event, dummy! And, actually, those are the only two things I put my foot down for. We went from green to some color change but a fast dropping of leaves due to storms . Enjoy your vista. Well, if the wedding was Star Wars themed, I would not be opposed. I went to a wedding where the bride and groom came out to the Star Trek: TNG theme. Epic. But, I have gone to a southern wedding in Jacksonville. My cousin's wedding was nice. The minister kinda looked at the northerners like we were from space or something. But, he was actually cool. He helped me figure out ways to get the best shots to put in my cousin's wedding video. And to avoid the photographer. She was....intense. Here I was with the camera I use in my videos and there she was with her set up. She was crazy. My cousin said I could make a wedding video and I did. So, the minister and I kinda did some covert ops. She did manage to take an official pic of me as I watched the dancing. I think that was her last laugh. Hmm.....You would think smashing cake in each other's face would be messier and more fun than mud. Whatever. Happy to hear your #1 daughter is doing well, now as to the wedding you and I both know daughter #2 and the wife will get what they want, we just say yes dear!! So glad our daughter is married and we do not have to go through that again! Aren't those grown daughters just wonderful though? I have five of them. Ros is an awesome person to work with to hone your skills. As for the changing of the seasons - ours were so off kilter this year. Spring was short and the weather odd, it has rained most of the summer, and the trees are just now starting to turn around us (when they are usually bare at this point). The lawn is still a beautiful green, it never dried out this summer. Yes they are, the joy of our lives. Daughters are the best! Genealogy-wise I occupied the scanner last night and scanned a file of my mum, with a ton of documents (among others my own birth certificate, the CV my mum had to write to get her naturalization and the birth certificates of my grandparents). Well, with that stuff scanned I could source all of my Balcanian family. Honestly, I didn't know we had an original school report of one of my uncles of 1933. Or the certificate from 1929 with the pay raise for my granddad. Now that they are scanned, they don't have to be taken out again of the folder. Have been catching up with things on Wikitree this week or so. Been following up on Bird family - my Dad's mothers family. Have managed to add to the Bird family on Wikitree. Although the Lido is closed for the winter, we are holding a coffee morning on Thursdays to keep in touch with our volunteers, for when we start on readying for the 2019 season. Not that we did any work on Thursday - it was raining quite heavily. However we enjoyed the Carrott cake Pam had made, along with the coffee. Chris sometimes the best thinking and planning work is done just sitting with some good food and good friends... it reminds you why you are volunteering! One is silver, the other is gold". This is really late for me and it will be sort of short. I have not done much on WikiTree this week and after last night the weekend will not be any better. On Thursday evening my long time companion, Diane, had to be rushed to the Emergency room. She was in extreme pain and had blood in her urine. After several tests and a Cat scan along with an ultrasound they found a kidney stone measuring 13mm, and no that is not a typo, it was actually about 1/2 inch in size for those of you who are not familiar with the metric system. They admitted her and this morning she had laser surgery to break up and extract the stone. She remains in the hospital tonight but the surgery was successful so she will be coming home tomorrow morning. Oh yes tomorrow morning I will not be around because I am teaching a class on Ham radio at the Emergency Management Agency so I had to make arrangements to have someone else bring her home as well as take the grandchildren to work because she will not be able to drive and I have a class to teach. All of the arrangements have been made so now it is time to do the laundry and pack everything I will need for tomorrow so that I can leave the house in less than 12 hours. I only got about 3 hours sleep last night, sleep is over rated anyway, so it is going to be rough and I will not WikiTree when sleepy, that is when I make errors. Catch up tomorrow evening if I am lucky. Dale take lots of deep breathes to get oxygen to keep you awake. (But don't hyperventilate do it slow and exhale completely too). Drive carefully. You have so much going on and are taking care of so many others please also take care of yourself! Laura, I don't want to stay awake much longer tonight. I plan to get up in about 9 hours so that I have time to eat and make myself clean and presentable for the class. Since I no longer use an alarm I am going to have to hit the bed soon. The hospital and the EMA are very close together and it takes me about 2 minutes driving at speed limit to get to either one so I see no reason to drive in an unsafe manner. At least folding laundry is a brainless task, I could do it in my sleep. Sweat dreams! Some cell phones have alarms you can set. I use mine when travelling. Laura, I wear hearing aids in both ears and when I take them out at night I would not hear any alarm. That is why I don't bother, besides my kid's say if I am in bed after 7 A. M. I am sick and there is some truth in that. But as you see I woke up fine and with plenty of time. Laura and everyone else, Diane is at home now. She has two follow up appointments in the near future and is still sore but she is improving. The operation was successful. I have other news, my second oldest grandson has been accepted to a Honors band. This band is made up of the most talented students from schools in a 3 county area. This means extra work and extra band practices, not to mention traveling to concert halls for performances and playing in front of fairly large audiences that are not your usual audience for school children. Now it is true some folks were honored more than once but I realized something... if you are honored you don't get a notification so you have no idea someone has thanked you! So, maybe you were honored and don't know it. We do have a wonderful group of members who drop in and out and we love you all! If you were not honored last week...just wait we have a new week this week. And I must admit I missed all of these! So I need to get busy and start letting you all know how terrific you are! Hello and happy weekend. Thank you for hosting Laura, thank you for the food Dorothy. I wish to share with you my excitement, a lovely surprise, I found on my profile page this morning, a purple generous genealogist badge. Apart from loving those badges, and I know i am not alone, I was absolutely surprised and dumb struck. To Susan Laursen I say thank you for thinking me deserving of such an honor. You made me smile and giggle all day and perhaps a little more confident in sharing with such a wonderful group of people. thank you ! I would also like to pose a question. Who is the wonderful Wikitreer who developed the bio generating app? I think it may be Steven Tibbits? Let me add a tip to quick inputs to wikitree when you have little time. '''Use that app !!!''' During the Source-a-thon I used it quite a bit to enhance the profiles after sourcing. The profiles looked so lonely with no life so I added a bit of bio by using the app. Don't tell my leaders that I "wasted time" doing bios when I should have been sourcing.... oops - hi Laura, hi Dorothy, thank goodness Loretta is not around. I am sure she would be ok with it. We did fine! Great team. Good tip on using that. I could have been Steve I don't know who developed it. PS: I too am guilty for making bio's when doing sourcing, force of habit... so you get points for that in my book lol!!! I love the big Star Laura, and the Congrats from Herbert. And thank you Dorothy I thought i should have had my mind to the grind stone to get more sourcing points. But you are right, I think we did fine. Right, Nicole! I do use that bio app. Ain’t it great?! Hi, all! I had my brother over for some games today and I think I persuaded him to be a back-up in case both I and my wife pass away at about the same time. It's probably a small chance, but it's probably helpful. We played Settlers of Catan and each of us won a game. I also got my CK 1000 badge though it doesn't mean too much since I was cleaning up my watchlist and am trying to make my profiles consistent. I have a couple of other runs around my 337x profiles before I'll get to adding sources for the masses, however. Right now I'm about ready to add another round of Ancestry.com sources. BTW, in case anyone else is working with Ancestry.com, I did find out it's pretty easy to use. I had been using the sources in the pages which display, but when I went to the Family tree which appears at the top of the first page, I found that most of them have actual sources listed and they can be used by clicking on both of the source on the page and then the View Record. this gives you the same page you'd get by clicking on a index page but you don't need to waste as much time. Of course you need to make sure the family person has chosen the right record, but most of the time they do. It's very nice weather outside here with highs in the 80s and lows about the 50s - 60s. Question; I have a lot more Presidents I'm a cousin to now than when I'd checked the last time. Have other people noticed this as well? Admittedly I haven't read all of the G2G messages lately, but if it's popular knowledge, give me a quick link. Having your brother be a PM back up is a great idea. Settlers of Catan is fun. Our family has played several versions of it. Not sure about the Presidents but I noticed my link to Queen Victoria is closer than it used to be. Dave, however you got your 1000 badge, whatever you do makes the content of WikiTree better, even if seems minor to you. Well done! Well it's the weekend already I starting to feel better again. Hopefully I had my sickness for the year. Alas, This past week I ordered yet another DNA Test from AncestryDNA so will see what this all shows. Not much to say this weekend as my brain is absent ideas, thoughts. Hopefully some inspiration will pop. Sometimes we just need some quiet reboot time. Weekends are good for that. I never sign in for Saturday sprints because I work all month on unsourced New York profiles. I don't feel the need for badge collection, but that is not my point for today. I am delighted to see that at the third day of November we now have 35 sourcerers signed up. That is almost the total we used to get for the whole month several years ago. This program is sure to help decrease the totals of unsourced profiles quicker. Many hands make lighter work. Is there a report that shows totals to compare to see if it really is improving? Beuhlah I am one of the 4 leaders for the Sourcerers' Challenges. One of the problems with measuring how much is done is that for every corrected profile there are new profiles added to the tree that may not be properly sourced. So the way I look at it is to see the number of profiles that have been corrected over time. 1. On the Project Page we track years of sourcing https://www.wikitree.com/wiki/Project:Sourcerers there is a link there to see the archive which is located at https://www.wikitree.com/wiki/Sourcerers_Challenge_Archive It shows from July 2015 through August of 2016 26,241 profiles sourced. I just realized these stats were not kept up so will contact the team and see what we can do to update this. And July 2015 through Dec shows 8,104. Have sent an email to my co-leaders about updating the Archive Page. 2. Another way I look is to go to the Data Doctor reports for unsourced profiles https://www.wikitree.com/wiki/Space:DBE_Unsourced this list is broken down by locations. It shows you the time period and newly added profiles that are showing as unsourced. If you are interested in a specific area you can print these and save them and check back to see if the numbers are whittling down. These will show all sourcing whether it is part of the Sourcerer's Challenges, the Source A Thon, or just folks doing their own thing. So as the numbers diminish you get an over all effect. In my mind it shows definite improvement. This years Source A Thon showed 72,713 improved profiles. 2017 Source A Thon showed 53,245 improved profiles. So I am pretty confident those are not in the totals I had above! Beulah, in my random searches for rabbit holes in the Unsourced profiles, I have found a lot of New Yorkers. Most of them have been the very frustrating and multitudinous Vandermarks, who seem to have had a family aversion to the public record. In particular, many of them evaded the US Census, although they usually appear in the New York Censuses. They all came from the same GEDCom and they all have the same unpublished (I think) family history as a (not verifiable?) source. I've had some small successes with them, but it is a struggle! @ Laura, the sourcerers project shows the growth in numbers, like I saw, participating and numbers sourced. I will have to write down the N. Y. statistics and compare them on a monthly basis. I, like you, have the general impression that we are gaining. I know what you mean with new unsourced being created all of the time. Sometimes I can wipe out a stretch of names like ones starting Be**** and come back two days later and find that about ten have refilled the spot. I just start over on the same spelled list again, but it sometimes does frustrate me, wondering why??? three dozen of them. Only, how many more thousands to go, and the number of spellings of those names change too often, even among siblings. Beulah there are so many ways of participating you should pick the ones you like doing. I am a data doctor but there are some errors I just avoid because they are not my cup of tea. I work on adding at least one source to every profile I come across that is unsourced, labeled as such or not, almost every day. I do not join the challenges and I am still finding profiles from years ago that are not only unsourced but are not on the list. Are we improving? I believe so, but there are still profiles being added that may look like they have sources when the actually are unsourced. I have also given up even checking my suggestion list most of the time. I work on the profiles on my watchlist going from the oldest edit date working forward to the present and I will fix the problem I find as I work on them. I agree, Dale. I don't understand slapping on an Unsourced tag and moving on. I think If you touch it, you own it. Like a camp site - leave it in better shape than you found it. If you're going to edit it at all, you should add at least one source. I usually find as many as I can while I'm in there. And I usually poke around at a relative or two, and it never fails there are some with completely blank profiles, not even an Unsourced tag. I think some of those are done in preparation for things like the Source A Thon and then perhaps the person can't find a source. Some people like to identify unsourced profiles and return to them later. But I have also seen sourced profiles get hit with the tag because someone could not read the language the source was in and did not realize it was a source. Laura, are you saying there are members who prioritize games over fixing things? I am shocked! They might just find their stash sourced next time they look. Herb I have seen people post about marking them in advance of events. 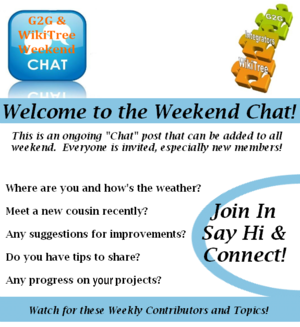 "Welcome to the Weekend Chat" February 2-4, 2018 All Members are Invited!